While exploring the Kaalaiki upper road between Pāhala and Nā'ālehu one day, we stopped to enjoy the scenic coastal view when John noticed a truck on a dirt road driving away from a distant bay. Hmmmm, we wondered, could we perhaps find this road to the bay? John noted that where the truck came out were some reddish cone shaped objects by the side of the highway, so on the way back we found the red cone and the road to Kāwā Bay. When we reached the bay, we were surprised to find quite a few vehicles. 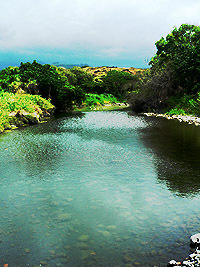 Apparently this hidden gem is known to the Ka'ū residents though we had not heard of it. 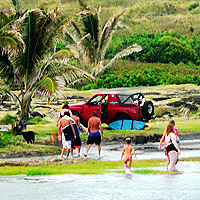 Families were cooking, people were surfing, and everyone was enjoying the perfect Ka'ū weather. If you are looking for a place to camp, or just relax on a beach, this hidden bay in Ka'ū is a pleasant stop and offers several hidden treasures. 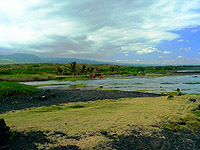 Kāwā Bay is in the Ka'ū District between the towns of Pāhala and Nā'ālehu. There are two roads that lead makai (towards the ocean) off of Highway 11. The first is at the 58.4 mile marker and the other is at the 58.6 mile marker. Both roads are passable without 4-wheel drive, but you do need high clearance so we do not recommend taking a regular car on either road. However, parking along the highway and walking would be fine, as neither road is very long nor difficult (probably about a third of a mile walk). The 58.6 mile marker entrance is a dirt road. Across the street is a large red abandoned cone (perhaps part of a dredge or some farm equipment). Turn on the dirt road and follow it. A number of side roads split off from the left, but continue on the main road and do not take any lefts. However, we are sure that at least one or two of the left side roads that will take you around to the other side of the bay (and where the other road goes). Eventually, if you follow the main dirt road, you will be at the coast where you will find a little fishing shack and nice open, rocky beach. A little inlet is to the left, perfect for cooling your feet, and across the inlet is the bay as well as other great spots. 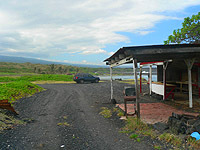 The 58.4 mile marker entrance is a lava road. There is a shanty home here as well. Turn onto the lava road and go past the shanty. A number of shanty houses are along this wide lava road, but continue past all of them, following the main road. After a number of turns, you will eventually come out on a beach where there are a number of crude campsites and quite a few places to park. On your right is the small inlet. In front of you is the bay itself, and to your left is the inland brackish pond. This area has had disputed ownership but was recently purchased by the State with plans to improve public access and protect native sites. This is not yet an official park. Besides a very crude outhouse (that I personally would be quite leery of), there are absolutely no facilities here. This is outdoor camping at its best - raw nature. 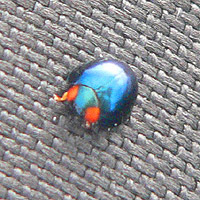 There are number of crude campsites - where people have built lava rock grill pits and rock chairs--there was even the occasional real chair. Swimming, fishing and surfing are all popular in this spot. Fresh springs feed into the ocean, both from the inlet and the bay itself. Be aware at all times for sharks, which are known to enjoy areas where fresh water mixes with salt water. 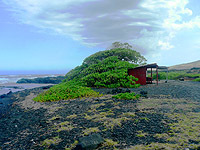 The ancient Hawaiian Heiau located on the ridge besides the bay is a protected historical site. Do not disturb the site nor move any of the stones in the area. Keep in mind that with the recent purchase of this land by the State, improvements and changes should be expected. The Ka'ū District, in this area, is usually sunny and dry. Expect hot, beach-type conditions with relatively little shade. This area can, at times, be quite breezy. 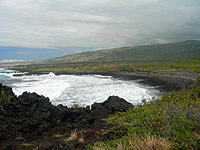 The area of Kāwā Bay appears several times in Hawaiian history. 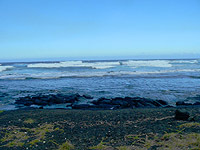 One of the more important entries concerns a Ka'ū chief, Nu'uanupa'ahu, who as a youngster, became a powerful and experienced surfer by surfing the waves in this bay. Nu'uanupa'ahu's knowledge of surfing paid off when he visited neighboring chiefs in the district of Kohala who decided to plot his death. The chiefs had heard of his surfing skills--so to kill him they took him to surf in a spot they knew had dangerous sharks. Nu'uanupa'ahu was indeed overtaken by sharks, but his incredible surfing skills allowed him to escape the sharks, which impressed his enemy. While Nu'uanupa'ahu did sustain wounds that ended up killing him, he did not die at the hands of his would-be assailants, but instead won their admiration at his show of skill and bravery. Today this same bay is still home to would-be chiefs honing their skills at the surf. 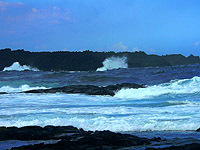 While not North-Shore quality of surf, when winds are high this bay does offer good waves and consistent surfing. Indeed, the day we visited, while not perfect surfing conditions, did find at least 3 or 4 bronze-skinned boys riding the waves into shore. For a surprisingly unwritten up spot, this quiet bay has actually appeared in a number of important roles throughout history. Besides the fascinating stories from Hawaiian legend, even today this small bay has played roles that have changed how we are allowed to enjoy Hawai'i. One of the more recent significant events in the bays history occurred in 1977 when the landowner of the bay and surrounding land sought to ban people from accessing the shore. Many landowners of shoreline property were, at that time, trying to prevent people from using the shoreline. Most complaints from the landowners arose from misuse of the land, trashing, leaving gates open and other such disrespectful actions from the people trespassing on the land. All the arguments finally reached a climax in the lawsuit of Barba vs. Okuna that was presented in 1982. The Hawai'i Third Circuit Court heard arguments from both sides -- with the landowners claiming property rights and the public maintaining ancient Hawaiian fishing rights and other shoreline access rights. To quote court briefs... 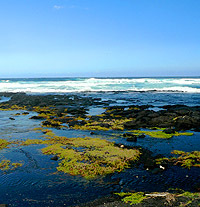 The Court made a connection between access and the public trust doctrine when it stated, "Any alienation or abandonment of an established public right-of-way by the Defendant State of Hawai'i which leaves the public without reasonable access to Kāwā Bay and the adjacent shoreline would constitute a breach of public trust." This ruling successfully established public access to Kāwā Bay on the basis of prescription, custom, dedication, reservation, and necessity. Interestingly enough, this went on to be a landmark case in other Hawai'i public access lawsuits and so remains one of the most important rulings that allow us to enjoy the coastline throughout the island. But let us return now to our visiting of the bay. We actually did this in two trips. The first was at the end of another extensive drive and we found the first, dirt road entrance. On the way out we noted a truck that we had seen at the other side of the bay, also coming out at the highway. We noted the second entrance/exit and explored it the following week. The entrance at 58.6 was our first visit. We took this and it quickly turned into a somewhat narrow dirt/lava road with tall grass on either side. A number of roads went off to the left and we suspect that some of them will take you to the other side of the bay. One left we did take dead-ended for no apparent reason, so not all are fruitful. While some of this road is passable by any car, sections definitely require clearance so any standard car should park at the road and walk the .3 miles in. Once you get to the end of the dirt/lava road, you are at the shoreline. Here you will find solitude as the majority of the other people are on the other side of a small inlet that separates you from the bay itself. 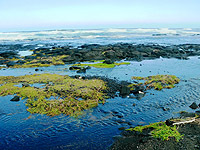 This inlet is very shallow and consists of fresh water rushing out to meet ocean water coming in. While we were there a number of locals were using the inlet to just cool off, walking carefully on the slippery bottom. People enjoy the inlet to cool off and splash around. This side of the bay seems to be the most popular for fishing. On our first visit absolutely nobody was fishing, but on our second visit to the other side of the inlet we noted a large number of fishing polls set out along the coast. A row of fishing poles dot the far side of the inlet as people enjoy a lazy Hawai'i afternoon. The next weekend we vowed to return and take the second, 58.4 mile marker, entrance. This entrance started by a really run-down shanty. A barking dog rushes out of the shanty, but nobody else. A bit further, on the left, is another shanty going up, and a bit further, again on the left, yet another - quite nice, shanty. A recent government interview in the area finds a number of homeless living in makeshift shanties in this area, although also a number of non-homeless. On our drive a few people came out, but all smiled and waved. Note: As the squaters in the area have been removed, the shanties and other structures will probably be going as well. The road itself is a smooth natural pahoehoe flow, but again we recommend a vehicle with high clearance. We noted a number of cars parked at the road and, of course, a lot of people down at the shore, so using this road and walking this road is accepted. The road itself is extremely wide so there is lots of room to maneuver, as you will need to do. At one point the straight-ahead is blocked with a 'pack-it-in-pack-it-out' sign and here you make a right and continue. Just a short distance past that it is another few turns and you're at the ocean. Here there are many places to park and many pre-built rock grills and campsites. An outhouse has been built by some resourceful individual but we won't attest to the usability. 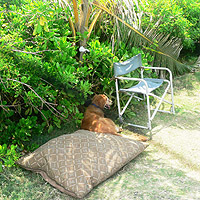 There is much area to explore here and you can walk to the inlet or relax by the bay. 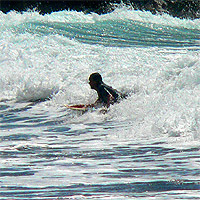 Most of the surfing is done in the bay and on calmer days swimming and snorkeling as well as diving are all popular. However, do be careful as there are a number of strong currents, which pull people off shore, most recently in March of 2003 a local man, harvesting 'opihi (a type of limpet) from the rocks, was sucked out to sea and drowned. Walking around the bay to the far side brings you to a rather stunning brackish pond. This is "a fresh water - meets salt water" environment that is quite large with a forested area behind. No doubt the blocked-off pack-in/out signs we saw was a trail leading to the far end of this delightful pond. 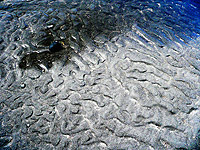 The pond itself is separated from the ocean by a natural pile of smooth rocks, the same of which line the shore here. We are certain that at high tide the ocean is probably above this line of rocks allowing fish to enter the pond. At the far end of the bay is a cliff and at the top of the cliff is a large Heiau. 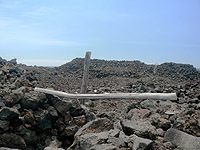 The Ke'ekū Heiau should not be confused with the Heiau of a similar name in Kona, and we could find little information as to the purpose this Heiau served. However, all Heiau were scared temples and offered certain protections both physical and spiritual. This particular Heiau is large and still visited as we saw signs of many offerings. 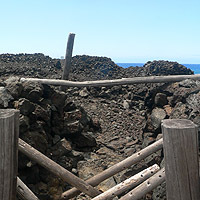 The Heiau is for Kane (men) only and should not be entered by women. Wrongful intent is not suggested for Kane to enter either. However, we simply recommend enjoying the Heiau from the outside and not from the inside. 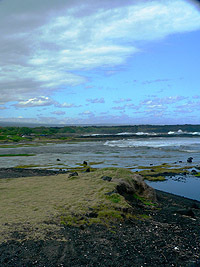 A sandy beach is below the cliff in front of the Heiau and much of the area is rich with olivine, giving the sand a slightly greenish hue. 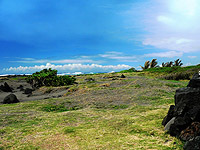 A trail extends from the Heiau along the coastline to Punalu'u Park and there are supposed burial sites scattered throughout the area. Whether you stop for a stroll, a soak, a swim, a surf, or for dinner and dreaming under the stars, this delightful bay in Ka'ū offers solitude, beauty, and the charm of ancient Hawai'i. This page is named 'Parks.kawa'. Can't Find It?